A. Pull over with no flashers on the side of the road in the dark in the worst part of town. That little issue aside, your alternators not working. 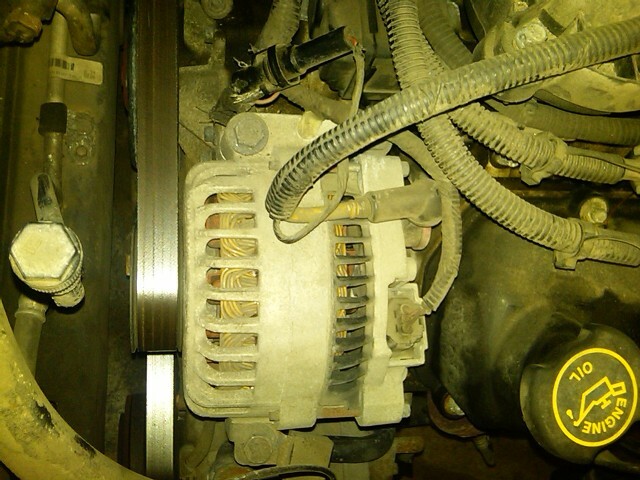 Replacing an alternator in a 2000 Ford Windstar is an easy job. Jack up Front Right of car (use jack stands for safety). Disconnect electrical from alternator (one snaps in, one bolts, the ground is on the mounting bolt). Take to FLAPS (Friendly Local Auto Parts Store) and buy a new / rebuilt alternator (take the old one with you or you'll have to pay a core deposit). Done - Easy, takes about 30-40 minutes. This is the bad alternator, you can remove it and have them test it, but one way i've always found to test one is keep it in the car, with the car running touch a screw-driver to the back, if it's magnetized than the alternator is working, if it isn't, it's toast. This is the inside tire well where you need to reach up and put a 13 mm wrench on the tensioner pulley, it's tight but not difficult. 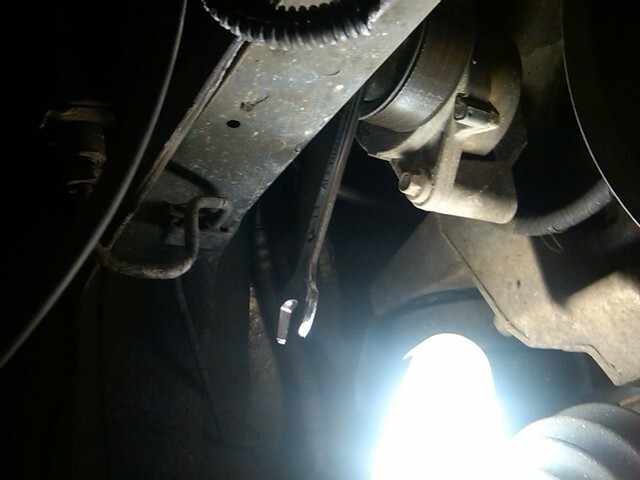 You can just see the wrench hanging off of the tensioner pulley. 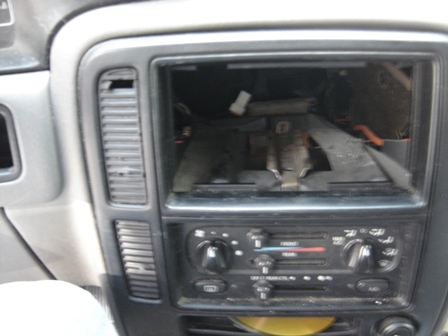 2000 Ford Windstar, no heat, thumping or clicking sound coming from behind the radio. This is caused by the blend door actuator breaking. Repair is fairly simple, though small hands and band aids are needed for this job. 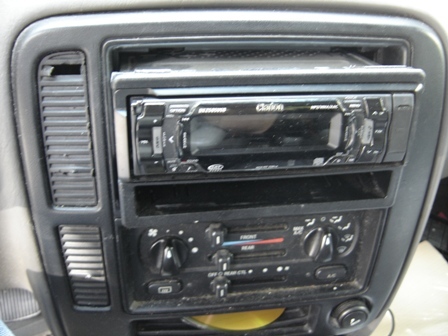 The blend door actuator is located directly behind the radio, but it will require removing the radio and the entire front dash that houses the HVAC controls. The procedure is fairly simple. The actuator costs about $35-50. Ford Dealer wanted $200.00 for this job, it took me about 30 minutes. Remove the Radio. If you still have the original Ford Unit, than you will need the Ford Radio Removal tool, u-shaped thingy, disconnect antenna and wiring harness, set aside. 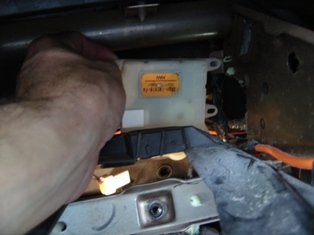 After the radio is out, remove all the nobs from the HVAC Controls (put somewhere safe). 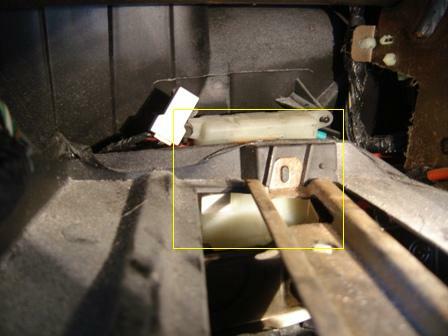 The HVAC Controls and remaining part of the dash trim is held in by four bolts, two up, two down. The top two are by the radio. The bottom two are to the left and right of the cup holder (when it is full open). Remove these bolts and the HVAC and Trim should remove as a unit. 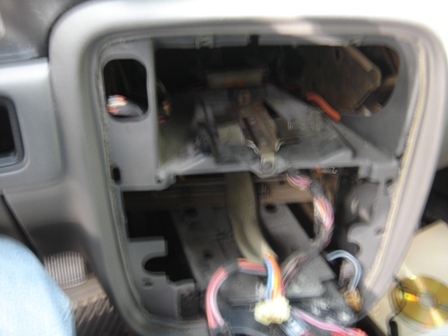 Remove the wiring harness and set aside. Now you should have a clear view inside the dash. If you look carefully all the way in the back you will see it. 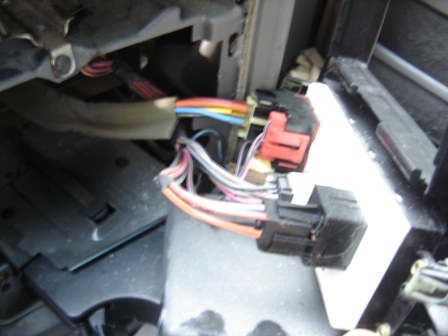 Disconnect the wiring harness to the actuator. 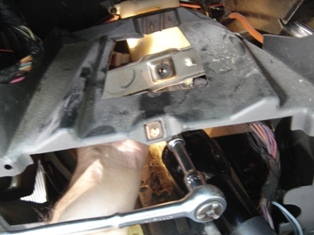 There are 4 bolts to the actuator. Using your really small miniature hands, get in there and unbolt them, going slow and carefully holding on the bolts so they don't fall, you'll need them for re-assembly. Also this is where you will need the band-aids. Once unbolted. Remove the Actuator. Now just reverse the whole process. Being careful not to loose the screws, over-tighten them, cut yourself, and do Remember to plug in the wiring harness to the actuator. 2000 Ford Windstar with a rough, low idle, occasionally stalling when coming to a stop. I put off repairing this for as long as I could, which as with most things, is not a good idea as it causes more damage. The end diagnosis is what I expected, though the cost of repairing this via a professional is expensive, but I needed it done quick and with little frustuation. Over-all putting off the work caused the EGR issue, but the tune-up and 02 sensor have been needed for a long time; i decided to have these done as well, if you've ever tried to get to the back plugs on the windstar you know why. Total estimated cost $1100-1200, ouch. I should do it myself, the intake kit is about $109.00, but it is a big job, and then throw in the 02 sensor, egr, plugs, wires etc and it's easily $400+ in parts alone....I needed it done right so we'd have a reliable vehicle. Finally found the root cause of the leak. After much trouble, a crack was found in the case of the transmission, that under high pressure was squirting / leaking transmission fluid onto the power steering components. Since both fluids happen to be red, and hydraulic it was easy to confuse the two. Car still runs fine, but the crack was caused by something "internal" breaking, so it may not run fine for long. I'm going to park and sit on it for a week or two. Replacement is 2000-2500, but I don't think I can find a used car for that amount, but Windstar's seem to just be frought with issues, so I may ditch it and get a good used car. 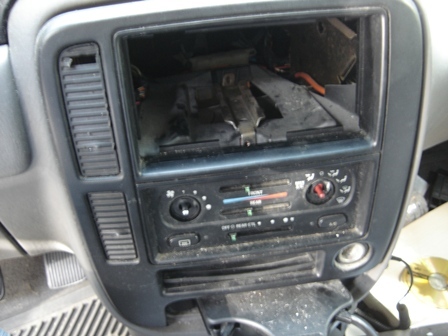 Definetly I'll be babying and preparing to sell my other windstar before it does the same thing, from what I understand this seems to be a common problem with 1998-2002 windstar around 100,000+ miles. Update, I'm ditching the windstar, i don't trust this dog enough to put $2500 into it, "this dog won't hunt no more". 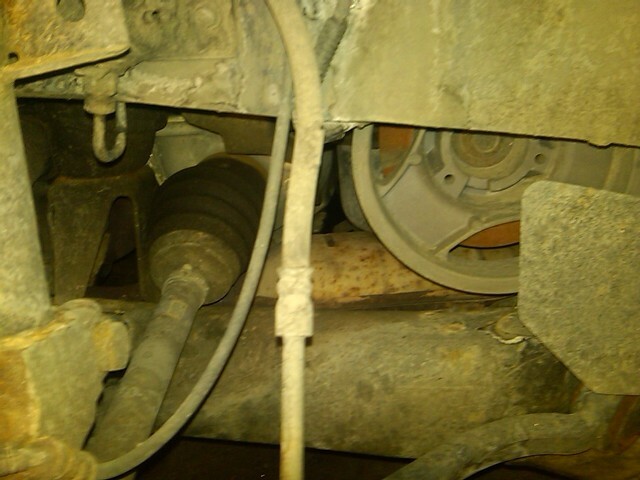 Windstar - Power steering leak ! This windstar is racking up the little issues. Pull into parking garage at work, smelling that tell-tale odor of hydraulic fluid burning. I've known that that 1998-2000 Ford Windstar's are known for transmission issues, of i've got that sinking feeling of having to decide on what to do, put $2500 into a car worth $3500 ? or move on to a different vehicle. Of course it's not just a leak, it's a flood and right over the catalytic converter too ! No driving this thing, too much risk of fire with little ones to tote around. Overall this car has been good to me, a great buy at $4,000, so i've got my money's worth, but sure would like to get more miles out of her. I decide it needs a professional diagnosis, so I take her up to Certified Transmission. Good news, maybe, it's not transmission fluid, but Power steering fluid, shop didn't charge me anything, nice. Being a transmission shop they can't determine the problem, but they also can't find where it's leaking from, not the pump, maybe the high pressure line or the Steering rack and pinion itself, yikes ! Definetly cheaper than a transmission, but now I'll have to take it to a shop that can hopefully put some dye into the power steering resevoir and figure out where the leak is...hopefully just a hose. (If anybody in Kansas City knows where to get this elusive power steering fluid dye, let me know, it maybe an urban legend. I visited 5 FLAPS (Friendly Local Auto Parts Store), and called several others, none carried it, though they all knew of it). Now I'll be taking the vehicle to Monte's Safety Line, a friend with the same year windstar had a similiar problem and Monte fixed him up for 380, so maybe I'll get lucky. UPDATE - 5/9 - WRONG, Monte reviewed and found no issue with the power steering, upon review with me, Monte drove the car up to Certified Transmission and helped diagnose the issue properly. 2000 Ford Windstar, 3.8l v6 - Odd squeal and hesitation and general "bad" noise detected while driving. I'm not 100% sure if it was the tensioner or idler pulley, but they were cheap enough parts to get and put in. If you have the $250-$300 to pay to have it done, go ahead, this was about a two hour job and $75.00 for the two parts. The tensioner and pulley is sold as a unit. This is a difficult task, due to the limited space. 3 Bolts. the one on the bottom is easy, the two on top were quite difficult. 10mm Bolts, top 2 require the smallest ratchet you can find; I have a 1/4" set, so it worked nicely. The smaller your hands the easier the job will be, I found it easier to get the top two bolts, from the top of the engine for both removal and installation. Finally couldn't take the squeaking and hesitation of my 2000 ford windstar, so I got to it and replaced the serpentine belt. After spending about 15 minutes to detemine the tensioner pulley was located on the very bottom, under the power steering pump (damn why didn't they put that up top ?). This means I couldn't release the tension and pull the belt off (because I had too lay on my side and reach up under and through the passenger wheel well). Called the wife and she pulled the belt off from the top. Review of the belt shows wear, nothing overly wrong with it, but with 115K miles; it's time to get a new one. Down to local FLAPS (Friendly local auto parts store), get talked into the $40 belt vs $20 (sucker !). Installation goes as expected, not hard, just have to be patient and work the belt around it's appropriate places (course Ford couldn't be smart and put a picture of the serpentine diagram somewhere in the engine compartment, but I drew a picture before taking the old one off (see i am wiser), and the new belt came with a diagram too). Getting the thing back on resulted in the same problem as getting it off, it just wasn't possible for me to grab the wrench and release the tension and put the belt back on (see description above). Call Wife, she tries to slip belt back on from top, but either doesn't have the hand strength or doesn't want to get pinched putting belt over idler pulley. I talk her into laying on the ground and reaching up to through the wheel well to the wrench on tensioner pulley....we were done 2 minutes later ! Car is running great no hesitiation, less squeaking; can only assume the hesitation was caused by the belt slipping occasionally and causing the alternator to "jump". Squeaking still makes let's me know that in the near future a water pump, alternator, power steer pump, tension or idler pulley will be calling out out to me, but that is expected with high mileage. Total time, 2 hours (including run to FLAPS).